Guy engaged in sports outdoor. 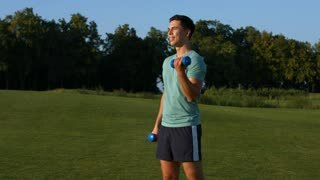 Guy engaged in fitness on a green meadow. Athletics on the street. Running athlete is ready to start. Sportsman at the start. Evening jogging. Athletics. Scamper on the nature. 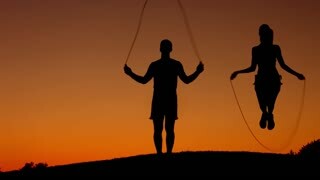 Guy with girl warming up on a skipping rope before the competition. Jumping on the a skipping rope outdoors. Sport workout outdoors. Athletics. Guy and girl run through the beautiful nature reserve. Healthy lifestyle. Athletics. Evening jogging outdoors. Morning sports. Athletics. Guy running on the evening park. Healthy lifestyle. Activity cross-country sport.